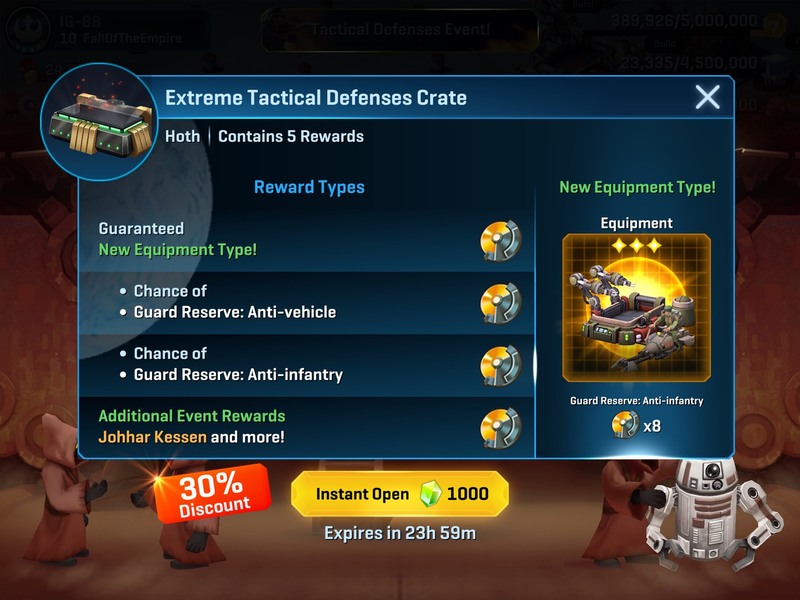 ANNOUNCEMENT: Limited Time Offer - Extreme Tactical Defense Crates! **IMPORTANT: There seems to be two types - one for 1000 Crystals and one for 1500 Crystals. The use of Johhar as a hero is now done. He will zombiefy on most bases soon. Same goes for using snipers... can't bring them to support attack, they'll go for a walk. Not that snipers were used recently to any extent. So heavy soldiers and starships for support... but those long build times will lomit game play. Rebels rely almost exclusively on infantry. And there is no anti-infantry unit (save speeders) than can shore up an offense. Donno.... i have been playing for 1.5 years, but this change is more radical than super turrets we had this past winter. 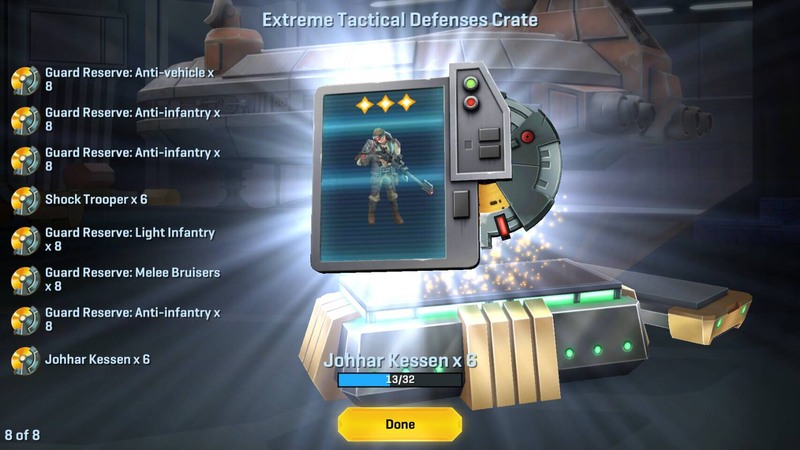 For those whom didn't open their Daily Crate until after the release of the Hotfix today are seeing today Tactical Defense Daily Crates. Just faceplanted my first attack against a base with the new buffs. Game is now dead if this is the new norm. Utterly pointless playing any longer, and I find that quite annoying given that I have been with this game for just under 2 years, but this is ridiculous. Nevermind wrote: Just faceplanted my first attack against a base with the new buffs. Game is now dead if this is the new norm. Utterly pointless playing any longer, and I find that quite annoying given that I have been with this game for just under 2 years, but this is ridiculous. They'll tone it back in about a month, but these buffs are here to stay. Which is more than I and many others will be. I'm running snipe and mhc buffs right now and went from winning 50% of my defenses after much experimenting to about 75% now. Needless to say, I like this update. That being said, it's nowhere near as crazy as turret gate when I was winning 95% of my defenses and turrets were rightfully nerfed. The rebels who win against my newly buffed defense have good strategies and adjust on the fly. Good for them. Those who faceplant simply dump their generalist troops & healers as always and expect their troops to roll my base while using 1-2 fangs to deal the SC troops. They did the exact same thing during turret gate, refusing to change their offense or adapt in any way, losing every attack and cried until they got what they wanted. Eventually, everything got buffed to the moon and people got their instant-win button they had before equipment, killing any notion of defense. That's changed, but offense is still alive if you have the patience and skill to win. I've attacked bases with the new equipment unlocked as well and man they're nasty. But I still find ways to win and enjoy the challenge. No, i'm not 3-starring bases, but so what? Everyone else is in the same boat, which makes conflicts just as competitive as always. What's the point in playing a game if you know you're going to win every time? How about trying the changes a few weeks before threatening to rage-quit? Yeah I got the 1500 crystal one I unlocked the anti vehicle barracks one. I got one as well: got 26 Kessen, 8 shockers, and 4 IG86 frags. I'll take it!